A view of the Made In America festival on the Ben Franklin Parkway in Phila., Pa. on September 3, 2017. 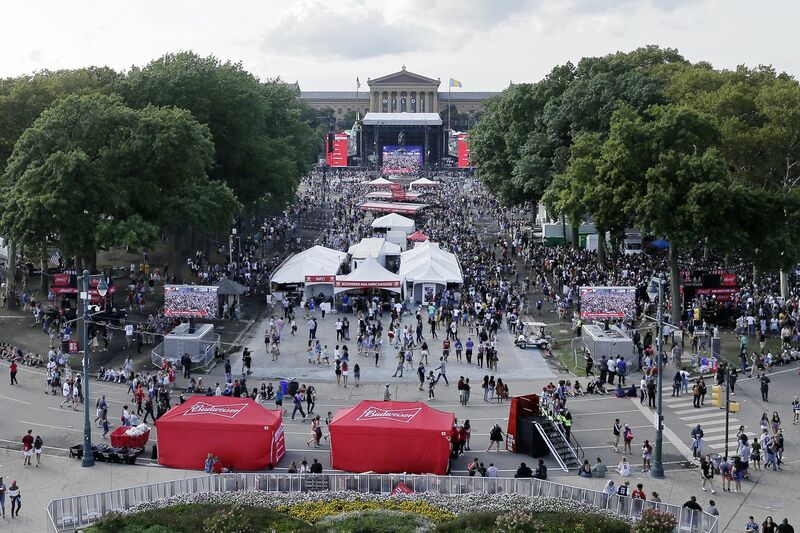 Along the Benjamin Franklin Parkway on Thursday afternoon, Made in America festival workers hustled to assemble the stages and speaker towers, bars and concession stands, Abercrombie & Fitch-branded VIP areas. Video screens flickering with colorful test patterns nearly blotted out the view of the Philadelphia Museum of Art, while a handful of dedicated tourists/Rocky reenactors held up their arms triumphantly at the top of the steps. At the museum's decidedly less iconic west entrance, a 69-year-old Center City resident who'd give only her first name, Camille ("I don't want to get nagged on the internet"), said she'd taken the Route 38 bus to squeeze in one last visit to the museum district before the area was sealed off with barricades. Parkway neighbors: Does Kenney represent us — or Jay-Z? "It's the last time I will come to any museum until this is all cleared up," she said. "It's a mess. It's almost impossible." That, it turns out, is a pretty common sentiment — one expected to make for a painfully quiet weekend for Parkway museums, despite the tens of thousands of visitors on their doorsteps starting Saturday. "It takes a toll on our attendance both in the time leading up, with the setup and road closures, and in some cases afterward, depending on how quickly everything is torn down," said Lisa Miller, chief financial officer at the Academy of Natural Sciences of Drexel University. "People think that's too much to deal with to even think about coming into the city during those times." The museum's attendance is down 50 percent for Labor Day weekend, on average, since Made in America debuted seven years ago. Other Parkway institutions — including the Art Museum and the Barnes Foundation — did not provide specifics, but said the festival also impacts their visitor numbers. "We have seen a significant attendance drop during the preparations, during the period of the concert itself, and during its immediate aftermath over the past five years, more so than during other regular Parkway events," Art Museum spokesman Norman Keyes said in an email. Camille said she has memberships to all the Parkway museums and visits frequently, but finds Made in America the most disruptive event because it's the only one that completely closes the Parkway and charges admission. Whether and how often to give over the Parkway to privately run special events has been a topic of debate among neighbors, institutional leaders, and city officials, who over the winter collaborated on a study that influenced the city's controversial decision to boot Made in America from the Parkway. After public blowback — and a caustic op-ed from Jay-Z, whose event company, Roc Nation, runs the festival — Mayor Kenney said in July that the festival could remain on the site after all. "Additionally, many of the institutions incurred some level of unreimbursed expenses — from somewhat modest to quite significant — for security and safety, damage mitigation, and lost productivity," the report noted. "Damage to infrastructure — sidewalks and other major hardscape — is accumulating over time, and restoration and refurbishment costs will require resources not currently accounted for in fees charged to event producers." They recommend a Parkway usage fee — perhaps $1 per ticket for all events held there — to be directed toward covering the losses incurred by nonprofit cultural institutions or restoring infrastructure along the Parkway. A spokesperson for Kenney said the city is considering it for future events. Whether such a fee could come close to covering the institutions' losses is unclear. At the Academy of Natural Sciences, each Made in America weekend costs about $25,000 to $50,000 in lost ticket admissions alone, by Miller's reckoning. The museum has tried to offer special promotions or pay-what-you-wish days over the years — but nothing has really made a dent. "People say, 'I just don't want to deal with it. I'll come some other time.' You hope they do, but they may not think to come back and do it at a later date," she said. "It's very hard, particularly with admissions, to recapture that." Peg Zminda, executive vice president at the Barnes, said Parkway events challenge the museum, but Made in America is no worse than the others. "We've made a conscious decision to close on Fourth of July here because we really can't compete with all the free programming that happens through Wawa Welcome America," she said in a July interview, during Kenney and Jay-Z's public scrap over Made in America's future. For the Art Museum, Keyes said, the primary challenge is making visitors aware of the access routes. On Thursday, the center lanes of the Parkway were already closed starting at 20th Street, and a stage blocked the museum steps. So visitors in the afternoon heat found themselves trudging up the driveway to the west entrance, where sidewalks vanish behind fences due to museum construction work. The city's list of official access routes includes the Spring Garden Street bridge — with the caveat that "it may be forced to close during periods of heavy pedestrian traffic." "Our sense is that MIA concertgoers appear to be coming mainly for MIA," he said. "At the same time, we reinforce as much as possible the fact that the museum welcomes everyone."